How do I contact Free U? How should people learn together? What can Free U be? How do I “teach” a class? What do we need to live and how can we get it? 206 Free Skool Website and riseup.net lists now up! 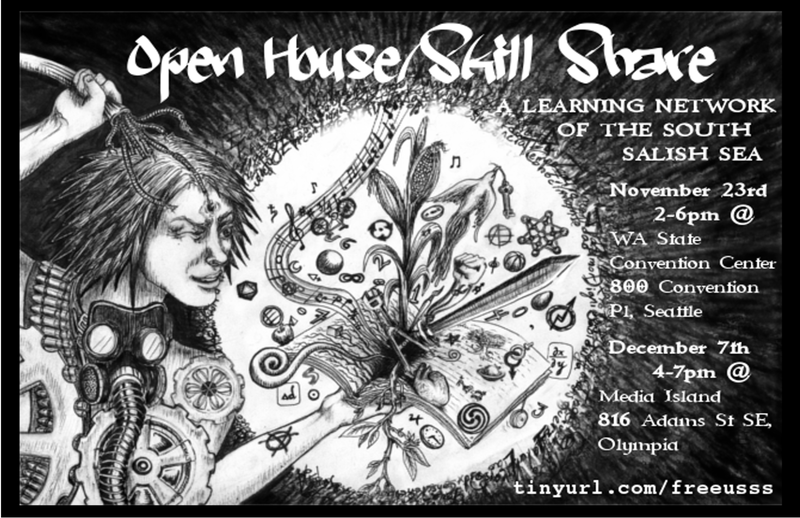 A new coalition of free skools or otherwise autonomous learning projects in the southern Salish Sea area (aka Puget Sound) is hosting a series of open houses. 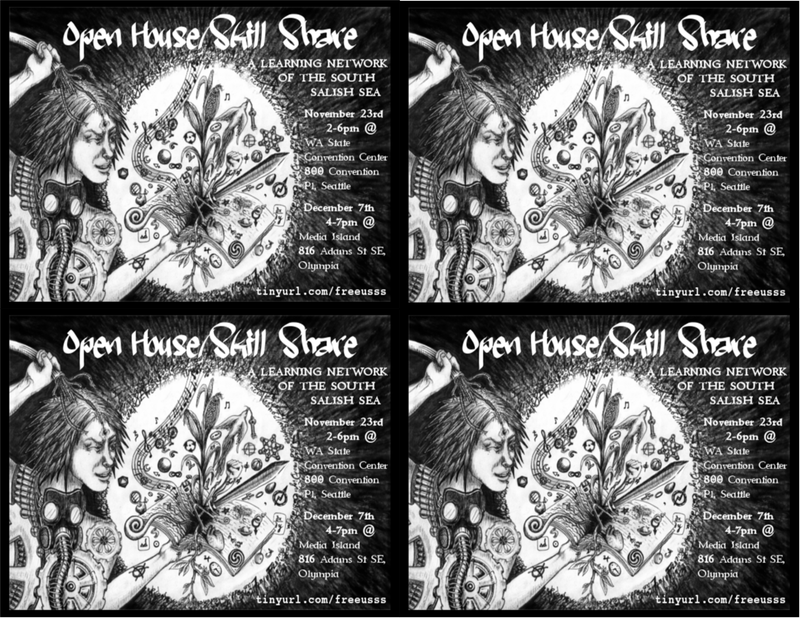 The purpose of these open houses/skill shares is to convoke people to gather for our collective self-determination. We will share our visions, dreams and current activities, and expand our capacity to work together in creating all that which education has suppressed. This is a long-term and multi-generational project for those of all levels of capacity. No money will be charged to attend any of these open houses or for any activities connected to this network/coalition. Free means FREE. Food will be provided, potluck style. Please refrain from wearing strong fragrances to faciltate a fragrance free, accessible space. Wheelchair accessible. These projects are taking place on contested lands which have been stolen from the indigenous peoples of this region by individual invaders/settlers, public and private corporations, and the US government. It is the intention of organizers of these gatherings to act in solidarity and joint struggle with native/tribal nations of the region and for the return and protection of their ancestral lands. Seattle is occupied Duwamish and Suquamish land. Olympia rests on occupied Nisqually territory. Tacoma is occupied Puyallup territory. Bellingham is occupied Lummi Nation territory. Memory is power. We demand that the State of Washington and the City of Seattle recognize the people of the “inside” Duwamish as a distinct class of people of over 600 who are being systematically oppressed economically, politically and culturally. The racial oppression that has been allowed to occur by the hands of local government, state government and the federal government is discriminatory and motivated by the Muckleshoot’s attempt to try to erase the history of Chief Seattle, his blood line, the Duwamish people. The Muckleshoot keep trying to claim Seattle’s history for their own. The Muckleshoot claim that the Duwamish integrated and folded themselves into the Muckleshoot Tribe. This is a lie. We are two unique and distinct groups who have historically never combined. Furthermore, we have never yielded our sovereignty as a distinct and separate Tribe. at disenfranchising and proliferating discrimination against the Duwamish people. The contemporary social and economic problems that the Duwamish membership now suffer can be directly linked to this campaign of political oppression directed at the Duwamish to minimize and marginalize our presence in this City. Because the Duwamish were considered a “Landless” Tribe, by Judge Bolt , we are no less a Treaty Tribe. While we fight our battle in court to have our status restored, we emphatically claim to be the only indigenous Tribe of the Seattle Puget Sound area. We will not resign in our fight for full recognition and we do not approve of the undiplomatic and inconsiderate treatment we have suffered in dealing with the Mayor’s office, Governor’s office, Port of Seattle, WDOT and the City of Seattle. I am all too aware of the many slights I have personally received and that our people have experienced over the last 40 years as the Chairwoman of this Tribe. We deserve and demand equal treatment as a racially distinct group of human beings, Native people. The members of the Duwamish are oppressed by inequality and disparity in this State because of the political status encumbered upon us erroneously. The discrimination against our membership of the Duwamish is realized with no Indian Education funding, lack of access to tribal housing, inadequate access to medical care, suicide, homelessness, poverty and substance abuse. Our children and families who self-identify as Duwamish on your census and on state health forms are not receiving any Tribal advocacy by way of Duwamish participation in ICW services, regarding CPS, adoptions, temporary placement and foster care. Our human rights as a distinct and separate tribal community have been systematically destroyed by political and cultural exclusion. The message of omission is an educational foundation of racism. This type of discrimination is instigated by the Muckleshoot who intend to cause terror and intimidation. Area Tribes have used their financial dominance to negatively influence ours and many other tribes who have been fighting a legal battle with the Department of the Interior for federal acknowledgment by paying lobbyist to twist the truth. We now face an old weapon of oppression made new again by Tribes who can now afford to spend millions of dollars to keep our court case on hold. These tactics have in design been orchestrated to try to re-write the history of the City of Seattle. There are many ways to tell History. It all depends on who’s allowed to tell the story. Ever since colonization of this area, Duwamish history has been shaped by the same socio-political and economic forces that determine the telling of it. The Duwamish never received an allotment of land. That’s the short story. The government was asked many times to expand the allotment at Port Madison to include enough room for the Duwamish. The initial allotment at Port Madison was inadequate for the number of people who were to go there, the Suquamish and Duwamish. Although there were other allotments set aside up and down this State, many of the Duwamish stayed or scattered across many allotments. The Duwamish Tribe are governed by a 1925 constitution and by-laws. The Duwamish did this to file suit against the government for land they ceded in the Treaty of Point Elliott, land they were to be paid for. To say our Tribe is only an “organization” is false. We fought to exercise our rights then and again whenfishing became an issue in this State. Native Americans were not allowed to vote in this State until well after 1924 when it became legal. Is it true that the Duwamish are no longer in existence? 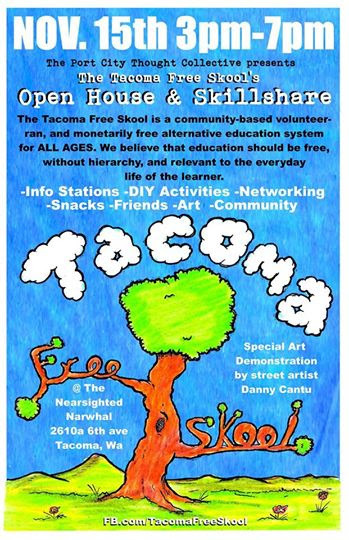 Do the Muckleshoot speak for the Duwamish? The answer is NO. 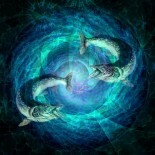 The Muckleshoot do not represent the Duwamish and the Duwamish do not represent the Muckleshoot or any other band. They never have and they never will. The Duwamish are still here! We demand equal rights as citizens. We demand that the State of Washington and the City of Seattle recognize the people of the Duwamish Tribe as a distinct class of people, a minority group, who have unique economic, political and cultural sovereignty over its members to protect their rights as human beings and indigenous people of this area. The discrimination against a minority of people by dominate groups should not be allowed as part of the government of this State. Justifying acts of discrimination is a violation of our human rights. We abhor the many outright attempts on the part of local, federal and TRIBAL government to deny the Duwamish people the right to have a voice. Here are just a few examples of the total disregard for the history of Seattle and future generations of our people. 1. The T107 archeological artifacts taken from within our display cases at the Duwamish Longhouse and Cultural Center and from the Burke Museum given to the Muckleshoot and Suquamish. The Port of Seattle and its commissioners orchestrated the purchase of the artifacts with these two Tribes, even though these artifacts are identified Duwamish. These artifacts were stored at the Burke Museum waiting for a proper “home” yet the Port of Seattle never gave ONE dime to help to assist the Duwamish in the construction of the Duwamish Longhouse and Cultural Center. The Port never responded to my request to explain prior documents that gave us the impression that we would have access to the collection and house the collection when and if we ever had a facility to place them. 2. Senators Patty Murray and Maria Cantwell, Governor Inslee, and Mayor McGinn have never answered repeated requests by leadership of the Duwamish, me to meet to discuss the political, economic and cultural challenges our native people face. After each election, politicians, receiving large political contributions from area Tribes, are “schooled” about the definition of what a “government to government” relationship is. The federal government made a treaty with the Duwamish Tribe in 1855. It should be fitting that politicians representing the citizens of this State and city take actions to decrease division in the native community by using your influence to improve native relations by showing support to all groups and bands without partiality to their political status. The Duwamish are entitled to equal treatment as the descendants of the same cohesive group of historical Treaty signers. the knowledge of what is appropriate in these matters. You look to the regulations to tell you what to do. As human beings, we have the right to rebury our ancestors. 4. And to top it off, a public park is planning to be developed on the Seattle waterfront, where Duwamish people would land their canoes in their pursuit to engage in the commerce of the day, the city that was named after their Duwamish Chief. 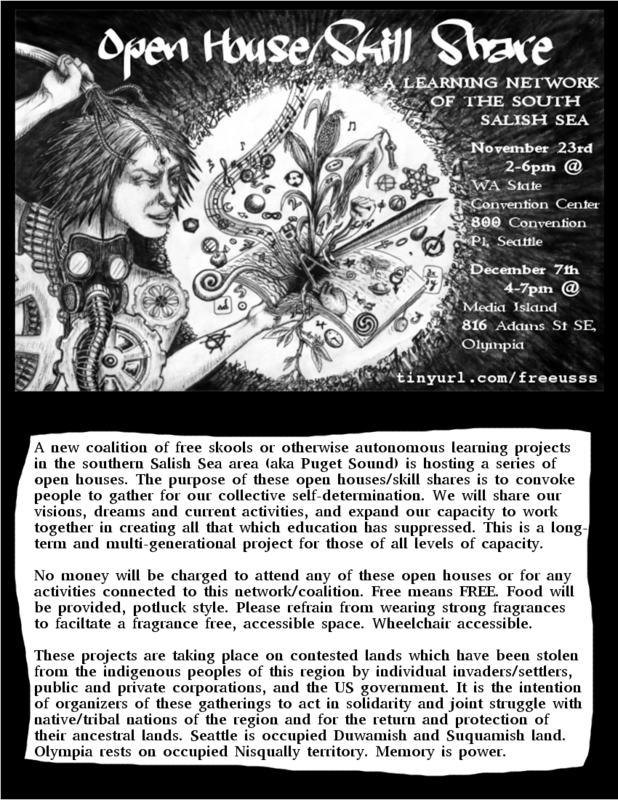 This so called “ public” park project that will be paid for using the taxes of the citizens of the City of Seattle and King County will employ the most egregious of discriminatory acts of all, by employing a selection committee of only “ federally recognized Tribes” to choose the art work and developing “cultural and educational institutions as part of the framework. The City of Seattle : Central Waterfront Tribal Artwork project, the Office of Arts Culture, in partnership with the Office of the Waterfront and Seattle Department of Transportation sent out notifications and distributed flyers to interested native American artists. What is the full plan at the Waterfront. Whose input and what consideration have been made to insure that the Duwamish are included in the planning for any permanent or public facilities at the waterfront. How much money will be contributed to the Waterfront public park project from “Recognized Tribes? Do their financial contributions to this project buy them a prominent place-marker at the Waterfront? Who has made this decision? Who is it that has the right to decide how to tell someone else’s story? If the City of Seattle were to change the selection committee to say only “Norwegian Immigrants”, or only “descendants of free slaves” shall be on the selection committee, there would be pandemonium at the doors of City Hall. This weird kind of “selection process” is discriminatory against Native Americans in general and only goes to show that after 160 years of trying to solve the “Indian” problem you are still getting it wrong. 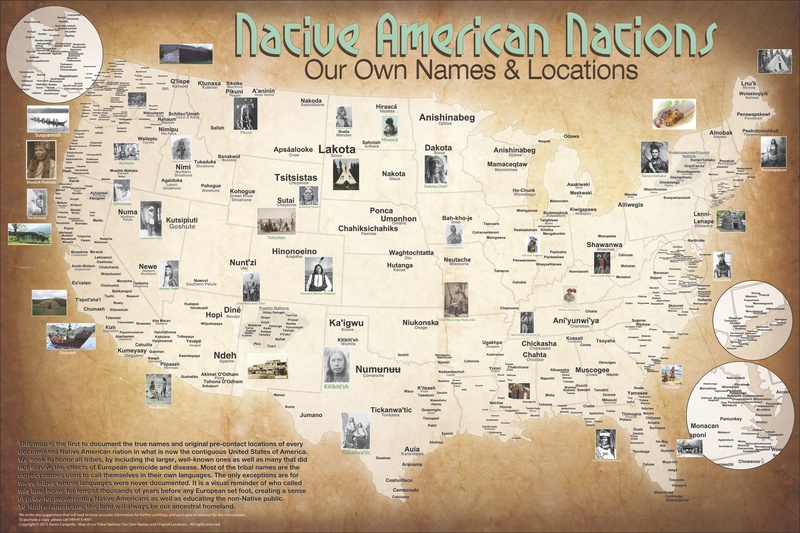 It might be 2014, but in the hearts and minds of native people we are as territorial as if it were 1854. Our people never asked to be displaced. Native people are proud which has been our strength and our weakness. We do not want nor do we desire to have people in leadership that do not know, honor or support the history of the city and the surrounding areas. Do not sell out to the “dominate” tribes whose onlyoption is to buy you into thinking that Seattle is their story to tell. They CANNOT change the facts of history. The Duwamish will never surrender and will keep fighting until the injustices forced upon our people, the members of the Duwamish Tribe are put to an end. good things to learn. Thanks for sending the info! Can I joyyn ur skool?